Everyone will know someone who has suffered from acne if not yourself. This unsightly condition can vary hugely from person to person sometimes only producing a few small, scattered spots, but in some cases acne can be very severe and painful, can hang around for years and leave facial and body scarring that can last a lifetime. Our skin is covered in tiny holes known as pores. In these pores a substance called sebum is produced which is an oil that keeps our skin soft and supple. Sometimes (usually hormonally charged) too much sebum is produced and the dead skin cells and oil together get trapped in the pores acting like a plug. This build-up in the pore prevents the skin from breathing and can also trap bacteria causing red and inflamed pustules that appear on the skin as acne. The symptoms of acne are relatively easy to diagnose and are most commonly in the form of rashes, spots and boils on or around the face, and sometimes shoulders, back and chest. Acne is more common in adolescents due to raised hormone levels but it does occur in adulthood too. Teenage acne tends to pass naturally as the patient reaches maturity. Colloidal silver is a very simple liquid solution with silver particles suspended in it. It kills germs by binding to and destroying proteins. One of the most popular uses is as an alternative treatment to antibiotics for treating acne. 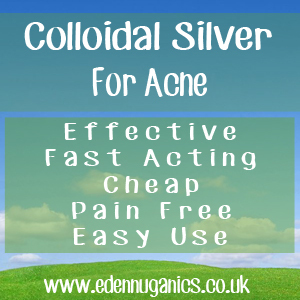 Topical application of colloidal silver has been a popular treatment for acne for over 50 years and although there have been very few official studies carried out, there is a lot of anecdotal evidence showing its effectiveness. How to Use Colloidal Silver? Colloidal silver should be used topically in the treatment of acne, this means applied to the skin using a cotton ball or soft clean cloth. Simply cover the affected area with the silver solution and leave to dry naturally. This can be repeated up to 3 times a day. The antibacterial and antiseptic properties of colloidal silver will help to reduce the bacteria in the spots which is what causes them to be red, angry and painful. Be sure to only purchase high quality colloidal silver as cheaper brands have been known to contain other substances. Apple cider vinegar - ACV is an extremely popular natural treatment for acne and with good reason. This ancient health elixir has antibacterial, antiviral and antifungal properties that can help to reduce and even completely clear some cases of acne. Baking soda - Baking soda helps to correct the pH balance of the skin. This factor often contributes to acne formation as bacteria thrive in an acid environment and baking soda produces a more alkaline environment. Baking soda also has mild anti-inflammatory and antiseptic properties that enable it to lessen the irritation caused by inflamed acne. Acupuncture - Although this may seem slightly odd in the treatment of acne, there has been a surprisingly large amount of information suggesting that this ancient Chinese practice can help to both prevent and cure even the most severe outbreaks of acne by balancing hormones.